No HOA, No Covenants, Zoned for Horses. Beautiful lookout mountain views. Plenty of open living space located off county maintained road. Open floor plan with breakfast bar and walk-out deck from the great room. Walk-out lower level with new kitchenette, two bedrooms, family room, and an additional room perfect for quiet office space. Quality craftsmanship and finishes. Private main level master bedroom with attached jetted bath and walk-in shower. Backs to Campbell ranch and 1,000's of private acres. Close to Eleven Mile Reservoir, Gold Medal fishing, the South Platte River, and hunting. Detached oversize garage, greenhouse, storage shed, and carport. Perfect home for a large family or rental possibilities. Home can function as two separate living spaces. Abundant nearby recreational opportunities. 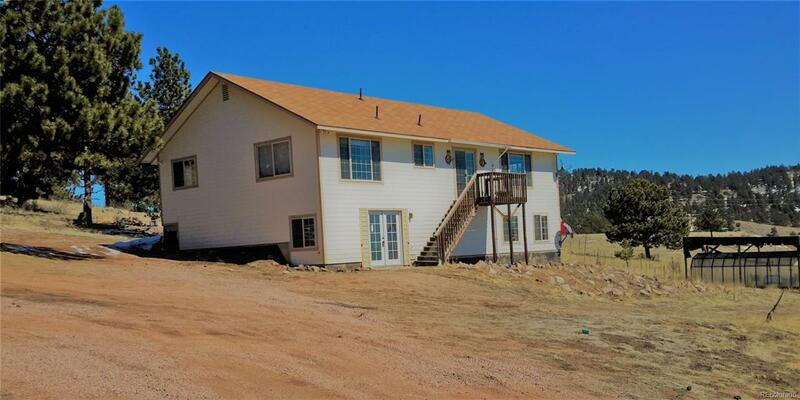 Only 15 miles to the mountain town of Guffey for groceries, school, dining, and entertainment. 45 minutes to Woodland Park or Canon City. Big Pikes Peak Views along CR 71.